Mabel took to the ring enthusiastically from her first outing at Waimate, when she won a Baby Puppy of Group, the first of four, going on to win two Baby Puppy in Show awards, at Canterbury Junior Kennel Society and Banks Peninsula A & P. Amid several Puppy in Groups, she won Puppy In Show at the Canterbury Ladies Kennel Association show on the 6th March 2010. In her first show as a Puppy, Mabel won Puppy in Group under Scottish visiting judge Mrs Anne Hutchison at the Nelson Centennial Show on the 30th January. In her regular column in N.Z. 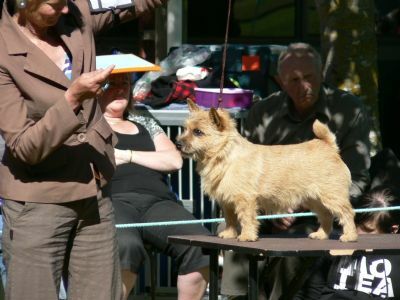 Dog World, Mrs Hutchison, who placed Mabel third from 56 entries in the Gold Rush Puppy Stakes at that show, had these kind words to say about her, "In third place, a Norwich Terrier, a really super puppy showed like a seasoned campaigner and such quality". 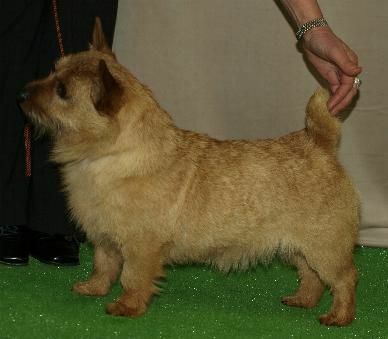 Mabel was the first Norwich Terrier to qualify for the Supreme Puppy of the Year Contest. She also won both the Canterbury Combined Terrier Club Baby Puppy of the Year and Puppy of the Year 2010, a special thrill as I have had the honour of being on the CCTC committee for some years, and am currently Secretary. Mabel was Supreme Personality Puppy at the Supreme Show Dog Contest in Christchurch, July 2011. She has her Gold Certificate of Merit (50 Challenges). On 10th September Mabel produced her first litter, five red puppies, 2 girls, 3 boys, to NZ Ch Rouletta Havin a Good Thyme (Imp UK). Typically, motherhood has been a breeze for this supremely self-confident little lady. Her second litter was a singleton, Norwester All For One, who made up for this by being a terrific show dog.